This unusual and interesting name is of Anglo-Saxon origin, and is an occupational surname for a husbandman, a farmer, originally a peasant farmer. The derivation of the name is from the Old English pre 7th Century 'husbonda', Old Norse 'husbondi', a compound of 'hus', house(hold) and 'bonda', bond, a term which originally described a man who was head of his own household. By the early Middle Ages, the word had developed into the Middle English 'husband', with a more generalised meaning of 'tiller of the soil, husbandman'. 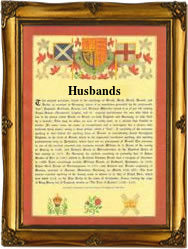 The modern forms of the surname are 'husband' and the patronymics 'Husbards' and 'Hosbons', meaning 'son of Husband'. The marriage of one Charles Husbands to Mary Cotton was recorded at St. Bride's, Fleet Street, London, on the 3rd December 1663. The first recorded spelling of the family name is shown to be that of Ernald Husebond, which was dated 1176, in the Yorkshire Pipe Rolls, during the reign of King Henry 11, known as 'The Builder of Churches', 1154 - 1189. Surnames became necessary when governments introduced personal taxation. In England this was known as Poll Tax. Throughout the centuries, surnames in every country have continued to "develop" often leading to astonishing variants of the original spelling.